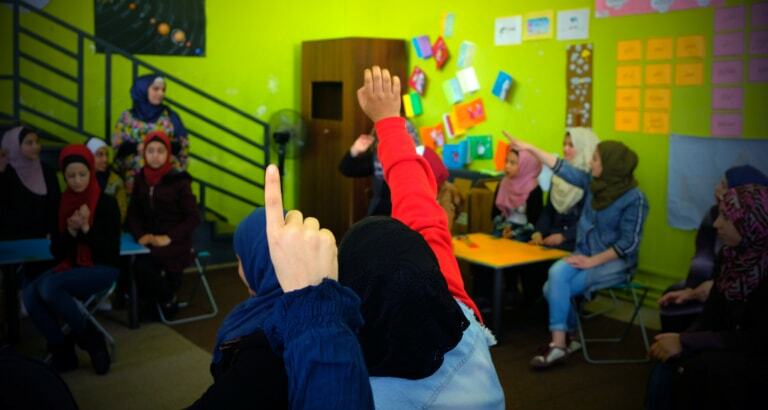 In September 2018, Libraries Without Borders partnered with the Jordanian Hashemite Fund for Human Development (JOHUD) to install a self-managed Ideas Box at one of their community centers in Amman, the capital of Jordan. Each day, children and adolescents who have dropped out of school visit the center to participate in thematic workshops created by our team leaders and community teachers, on topics ranging from literacy to English language learning, from child protection to gender equality. We spoke with Narjis, Areej, and Hanan, facilitators of the Ideas Box, who provided first-hand accounts of the project at JOHUD. In Jordan, high transportation costs keep a number of young people from going to school, most notably girls whose parents fear that they’ll be harassed or assaulted on the way there. As for boys, the lack of economic opportunities often forces them to work early on. What’s more, those who drop out of school at a very young age are usually not allowed to re-enroll, leaving them out of the education system altogether. 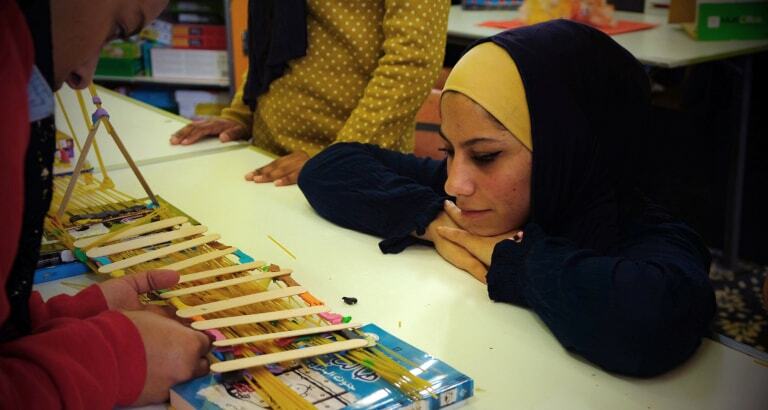 To address the large population of drop-out students, JOHUD has set up multiple non-formal education centers in Amman, offering young people the possibility to pursue an academic path divided into three cycles and then receive a certificate. It’s in the center at Marka, on the outskirts of Amman, where an Ideas Box was installed in September 2018. Since the deployment of the Ideas Box, our team has trained several facilitators and worked together with local teachers at the center, prompting conversations about new ways of learning. 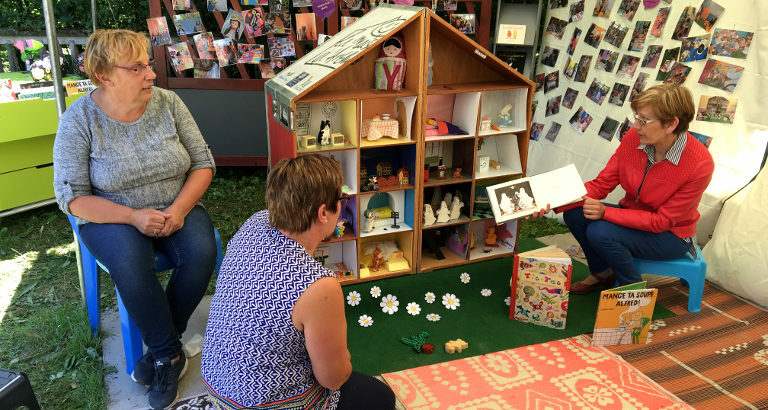 The teachers have not only integrated the Ideas Box’s tools and resources into their courses, they have also used it to develop thematic workshops for students. “With the Ideas Box, we wanted to show students and teachers that there are new ways of learning and teaching, ones that are more interactive and dynamic. That it’s, for example, possible to learn about the solar system by playing,” explained Narjis, IT officer and team trainer at Libraries Without Borders. Twice a week, students can also participate in two optional workshops at the Ideas Box: one focused on scientific topics, and another centered on comic book writing and stop motion film animation. “The first session was about how the Earth was created, and it was supposed to take two hours, but it took us six hours because the students were asking many questions. Even students who had not initially shown interest in the Ideas Box started to participate more and more. Ayan, one of the students, gave us a hard time at the beginning. He didn’t want to participate in the workshops, but he also didn’t want the session to go well, so he was disrupting his classmates. Some of the teachers did not want to let him come to the Ideas Box anymore, and for us that was a big no because everyone should have the opportunity to come to the Ideas Box. It’s our task as facilitators and teachers to figure out why the student is disruptive. One time, we were organizing a handicraft activity – in which Ayan participated – where each student was supposed to make a pop-up card. That day, we all watched him: he was very quiet, working on his things, and helping others. It was like he was a new, different person. After that, we realized that he prefers to work by himself rather than sit and listen to the teacher. The JOHUD team is now more attentive to include him in handicraft activities,” recalled Narjis. For Hanan, the Ideas Box is a “window to knowledge” that students can engage with and search for information. This project has enabled our team and the teachers at JOHUD to introduce new tools as well as physical and digital resources at the community center, inviting teachers and students to think differently. In Jordan, nine Ideas Boxes and seven KoomBooks are installed in numerous cities and refugee camps. Every day, these projects uplift the voices of those who have been silenced for so long. With your support, we will be able to reach even more communities: make a donation!